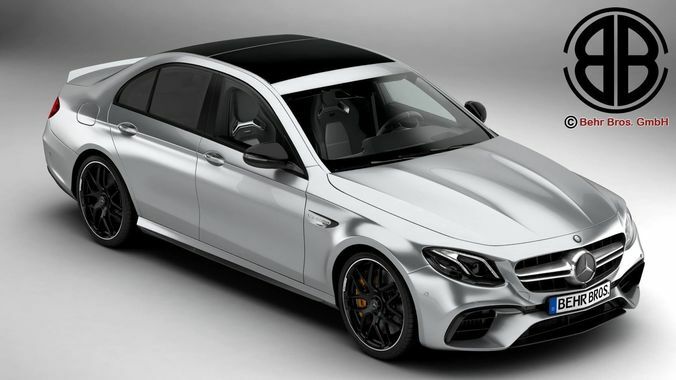 Accurate very high definition Mercedes AMG E63 S 2018 model with highly detailed interior fully textured. Headlights and taillights are modelled, doors and trunk lid can be opened. The model includes modelled tires. Most parts of the model have been created as SubDivision/TurboSmooth surface. This means using the 3dSMax or the Maya 2013 version you can change the resolution/smoothness of the surface very easy. If you import the lowest resolution of the .obj .fbx or .lwo version into a 3D Software that supports SubDivision surfaces you can also change the resolution/smoothness of the surface very easy. The base version of the model which is not smoothed has of 2064024 polygons. For other software packages that do not support SubDivision surfaces the model is available in 2 different resolutions ranging from 2064024 to 8166380 polygons. 3ds Max 2010 / 3ds Max 2013 Format: TurboSmooth is applied so you can set the object resolution as you like. Just use the Named Selection Set TurboSmooth to select the SubD objects and the Named Selection Set interior for the interior. The doors are animated. 3ds Max 2010 version has standard 3ds Max materials applied. 3ds Max 2013 version has VRay materials applied. Maya 2013 Format: A selection set for all SubDivision surface parts is included so you can change the resolution easily. A display layer for the interior is included so you can hide it easily if needed. Maya 2010/ FBX/ Cinema 4D 9.6/ Lwo 6.0 / Obj/ 3ds Format: In 2 different resolutions. Interior and exterior are saved separately so you can use the car also without the interior.